At Crandon Beach we met Robin Diaz a local bander (ringer). She told us a fascinating story about one of the wintering Piping Plovers who had earned the name Rocky. A peculiar name for a plover as it conjures up tough, pugilistic pictures in the mind and Piping Plovers are soft, round, cuddly creatures. But it was not because of an ebullient nature that this bird had earned its handle. 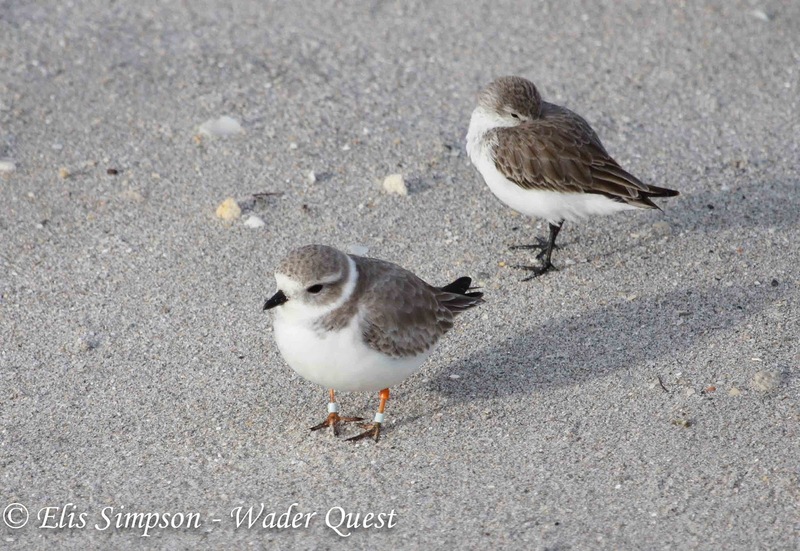 Rocky the Piping Plover with a sleeping Western Sandpiper. Rocky is a male Piping Plover that hatched in 2004 and was banded in 2006 on North Manitou Island in Sleeping Bear Dunes National Lakeshore. His band combination is: -,Ob:X,b His first recorded winter on Crandon Beach was 2007 but survey information from 2006 is missing so perhaps he was here as early as 2006. He usually arrives in mid-November and stays through most of April. He probably hangs out somewhere after leaving the breeding grounds and before coming to FL. This season (2012-2013) is his 6th winter on Crandon Beach! Rocky received his moniker when he first started breeding in MI. He made a scrape next to his mate’s and somehow put 4 egg-shaped rocks into his scrape. 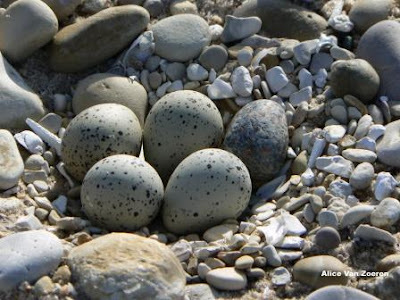 When he exchanged places with his mate, Rocky would incubate the rocks instead of the eggs. None of Rocky's first clutch of eggs hatched in the wild. They were brought to captive-rearing where one was already dead and three were helped to hatch by zookeepers. Of these, two died in the first hours but one survived to fledging. The following summer he used the correct scrape but he added an egg-shaped rock. The eggs hatched, the rock did not. Rocky is very special!! His mate of the past 2 summers is wintering 2012-2013 in Ft. Myers, FL. A big thank you to Robin for sharing this interesting story with us and to Alice van Zoeren for the photo of Rocky's nest provided via Robin. Thanks for your comment Peter. Sorry it took us so long to find it! We loved this story, as you say, brought a smile to our faces. But how did he move those rocks?